There is two different versions of Jacques Rivette’s film Out 1: the long one, Noli me tangere (1971, 12h30) and, if not shorter, let’s say the abridged version: Spectre (1974, 4h20). Both films could not be found anywhere anymore. This Wednesday, Noli me tangere‘s long-awaited new release is truly a major event, first because it fills a huge gap in the filmography of one of the most important modern film directors and second because it comes out on several different medium: DVD, Blu-Ray, VOD and arthouses. What a thrilling challenge. How can you program a film more than twelve hours long in a theatre? This is a question worth raising if you do not wish to live in a world where you need to go to the museum to watch a piece this long. The Café des Images decided to program Out 1 during the weekend on Saturday, November 21st and Sunday, November 22nd. As a foreword to this exceptional projection, we handed a microphone to Vincent Paul-Boncour, the co-founder of Carlotta, the distribution company (located both in Paris and New York) that oversaw the restoration process of the print. Craig Keller, a filmmaker, a critic and the former manager for Blu-Rays and DVDs prestigious publisher Masters of Cinema who now lives in the USA, was kind enough to interview him for us. You can also read the French translation of this interview. Come back next week to read the second part of this interview, both in French and in English. Craig Keller : Nothing is more special this year, or has been more in demand than Out 1, at least in America. If you could talk a bit about how the project came together and how it was able to finally be licensed and restored. What is the genesis of the Out 1 project? Vincent Paul-Boncour : Out 1 has been a project for us for a long time. It wasn’t so much a question of rights, because the rights have been available for many years now from the original producer. The main difficulty was the question of the material, of course. Because we’re talking about a movie of 12 hours 30 minutes for Noli me tangere, the long version, and 4 hours 30 minutes for Spectre, the short version, so to be able to create HD elements for these two titles, it’s like doing maybe six or seven titles at the same time. And in the end, it’s just one movie, even though there are two versions, completely different from one another. A few years ago, a German distributor [absolut Medien] released a box set of Out 1 on DVD — it was the first release [of the film] on DVD. But they did it because they wanted to release it, and they were waiting a long time, and the only way to release it was with the material not restored — not so bad, but not so great — but at the time it was the best material available, and it was the material made for German television years ago. So they worked with that. And Blu-ray was not at the same level then as it is nowadays, so to release the film like that on DVD could be a possibility, even though the quality was average, and even better than average but impossible to release on Blu-ray with this kind of material. So we waited four years, and recently the government, and the system of cinemas, the CNC, created a deal regarding the extension of digital, and the fact that you have to preserve movies doing restoration in HD to be able to show them, whatever the media, in digital, and to be able to go on to preservation in 35mm. They created a new category, a subsidy for French titles to which you could apply to have a contribution from the CNC toward the restoration of a title. So it’s a selective commission. And, so, with Stéphane Tchalgadjieff we submitted this title maybe a year ago, and the film was selected, and got an important subsidy because it’s a huge budget for the restoration, and in that way we managed to go ahead with this new element that you will see on the upcoming DVD/Blu-ray release, but also in the theaters, because having the digital restoration and elements you’re able to make a DCP, and the DCP is the main way now to show films in theaters. So, thanks to the technology, now, as we just started last week in New York and we’re starting next week in France, we’re able to show Out 1, the long version, on the big screen as you’ve never been able to do before. Because as you know the film only in recent years got presented for a very few screenings; in the ‘70s, when it was made, there was no real release of the film itself. Not only because of the running time have screenings been so rare — that was a fact also — but because of the material itself: it was a 16mm print, with electronic subtitles for foreign countries, and the color was quite faded. So even people who saw it in these rare screenings have never seen the film like this, with such quality of the colors, the grain. The restoration was supervised by the DP at the time of the shoot, Pierre-William Glenn. The result is amazing. C.K. : When I saw the trailer for this new restoration, it blew me away. I saw the long version twice during both runs at the Museum of the Moving Image, 2006 and 2007, and it was faded — but it wasn’t as bad as when I saw Out 1: Spectre for the first time, in 2006 at Anthology Film Archives, because that was almost completely pink! So this restoration is gorgeous; the grain is gorgeous. Also, a lot of people who have never seen the film never knew until this new trailer and the promotional stills that you’ve released, that the film is even in color! Because all the promotional stills from the past have always been in black and white! V.P-B : Yeah! You were just seeing on the Web, or whatever, only black and white photos! And when you see the colors, they’re really amazing, because it’s really the colors of the ‘70s — and you’re really traveling in the ‘70s itself. C.K. : Did the producer Stéphane Tchalgadjieff finance the film by himself initially? How did he come to the film? V.P-B : He was trying to get money from different partners and so on. It seems to have been a day-by-day adventure. A few years after Noli me tangere was first completed, they made the short version that they managed to release as a classic title in a commercial way, because, regarding the financing, the film had to be released in theaters, and it was impossible with the long version. So in ’73 or ’74, they had to come out with the short version, Spectre, so this is the version that had really been released at the time in theaters in France. Despite the running time, we feel it’s an opportunity not to miss : for a film like Out 1, the experience of the theater is important. C.K. : Is Noli me tangere getting its own lengthy theatrical release in Paris now? C.K : Does the response to this film make it one of your biggest successes? V.P-B : Yes. A few months ago when we announced the release, we got amazing feedback on social networks, and there was a lot of excitement around the release. The two amazing responses we’ve gotten so far are with movies — two completely different and opposite ones — that we’ll be releasing by the end of this year: Out 1 and Body Double. But also the way we’re working, we’re thinking of the release of the film, the box sets of both of them, we’re doing something unique. And of course for any title, we can’t increase any interest if there’s no interest at all at the beginning. But all the huge press and promotion we’ve gotten on Out 1 — it’s because a lot of people have never seen Out 1 or have only just heard recently about the title. And there’s a lot of curiosity because it’s a Jacques Rivette movie, and in the movie you have a good part of much of the talent of the French New Wave: even Éric Rohmer has a small part as an actor; Barbet Schroeder; the actor Jean-Pierre Léaud, who is really an icon of the French New Wave actors. There are talents such as Suzanne Schiffman, who is the assistant [on the film], and she was the assistant of Truffaut. You have Pierre-William Glenn as the DP. Jean-François Stévenin was working behind the scenes and also has a small part… So even though it’s a little bit “post-Nouvelle Vague in the ‘70s,” it really has the spirit of almost all the French New Wave movement. And the fact that it’s such a crazy project of 13 hours in eight parts really excites the interest of the cinephile and other people too. C.K. : Can you talk about the packaging of the film, the bonuses, and so on? V.P-B : Yes, it will be a huge box set. This might be the most important one we’ve ever done. There is only one edition — we didn’t do a separate DVD and Blu-ray; all together we have a kind of combo; there will be only one object you can have. Inside there will be the two versions of the films, on both DVD and Blu-ray, so it’s six Blu-rays and seven DVDs, I think. There will be a feature-length documentary made by Robert Fischer, a director we work with on different projects. It will be a two-hour documentary going back across the whole history of the film with all the actors shot during the present day. 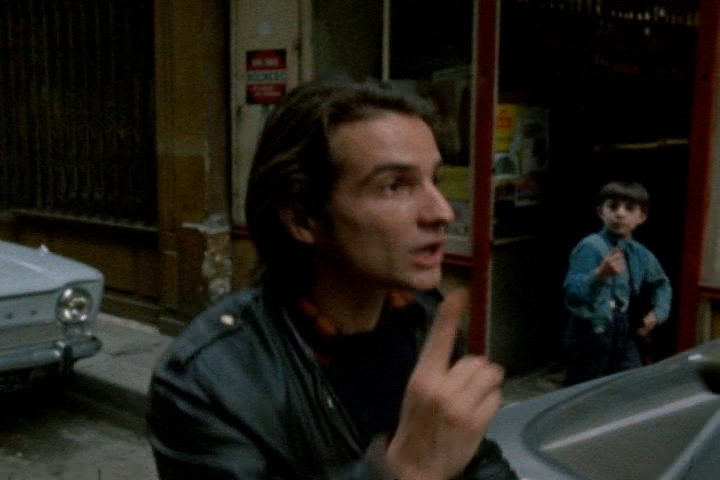 And archival Rivette interviews that are quite interesting pieces. And because there’s so much to say, read, and see with regard to Out 1 there will be a very consequential book of 120 pages with many texts and photographs from behind the scenes — the set photographer was Pierre Zucca, another emblematic character of the French New Wave, having been the set photographer on many Godard and Truffaut films, and himself afterward having become a director… I do believe it will be the most complete box set you can find on Out 1 thanks to all the elements. I think you’ll find everything. C.K. : The book will be bilingual? V.P-B : Yes. We tried to do as much as possible to make one object that is as identical as possible between the US and French editions. So the box set itself will be exactly the same for France and the US with only the difference of the text and languages on the outside of the box. The book will also be the same. C.K. : Who are you partnering with in America? V.P-B. : The release in America regarding the Blu-ray/DVD and VOD is being done with Kino Lorber. They’re a video distributor in the US but they’re also doing distribution with independent companies. We have a deal with them that they’re our partner doing the distribution on our release. Of course we’re the producer on the object from the beginning to the end, but they’re working more on the commercial aspect, and they’re bringing along their expertise about the video market in the US. C.K. : How long ago did you have the premiere in Paris, where the actors and crew appeared? V.P-B. : It was at the end of September. C.K. : Was that the first time that they had seen the film since the ‘70s? V.P-B. : Yes, for most of them. And for example, it was very funny, because Bulle Ogier arrived at the end of the first day, because she was not in Paris, and she stayed in the evening watching, I believe, parts 3 and 4. And she came back the following day, just as an audience member, to watch the four following parts, because she hadn’t seen it since then. And didn’t remember too much. Because it’s hard to believe — it’s been almost fifty years. So yeah, there was a lot of emotion among all the talent that was there. And a lot of them are quite involved around the release, such as Bulle Ogier. You could see it was really something, the film, for them — and certainly also the experience of the film looking amazing. C.K. : Were you able to have any contact with Jean-Pierre Léaud around the release? V.P-B. : Not really… We tried to get him involved, even though he does few interviews. And we didn’t manage to get him for the documentary. So no, unfortunately. It’s not the fact that he doesn’t want to talk about it, but he’s not really fond of interviews. And at the same time, he was just shooting a new movie in October. He was busy.